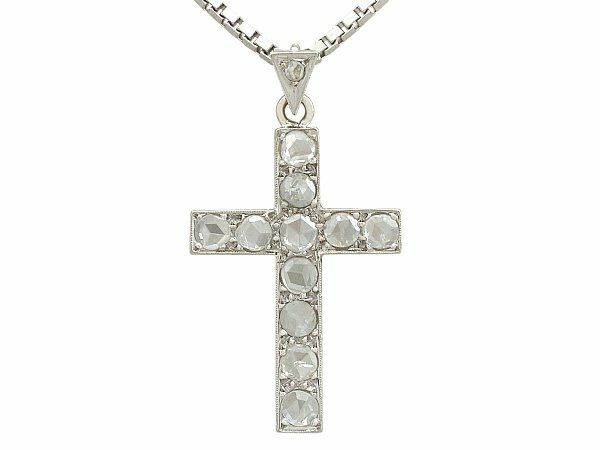 This fine and impressive antique diamond cross pendant has been crafted in 10 ct white gold with a contemporary 14 ct white gold chain. The simple yet effective cross design is ornamented with eleven pavé set Rose Dutch cut diamonds. The cross design frame suspends from a contemporary 18" box chain, crafted in 14 ct white gold, via a flared ring loop to the upper border. The ring loop attachment is accented with a single Rose Dutch cut diamond. The chain secures with a conventional spring loaded bolt ring fastening, hallmarked with the 14 ct gold mark (14KT). This antique diamond cross pendant has been independently tested using state of the art technology (Niton XL2 Analyzer) and verified as 10 ct gold. 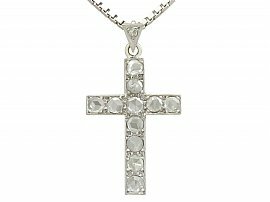 This antique 1920's cross pendant is fine quality set with very high colour graded old cut diamonds. The pendant is a very good gauge of gold and is in excellent condition, the chain hallmarked to the clasp.